Patented QuadTruss® design (patent #5,390,803) makes shelves up to 25% stronger and provides a retaining ledge for increased storage stability and product retention. Open-wire construction promotes higher visibility by allowing light to pass through the shelves, permits greater air circulation which helps reduce dust and contamination build up, and increases the effectiveness of fire suppres­sion systems. 63" posts are numbered on vertical one inch incre­ments to help ensure fast and level assembly. Shelving can be adjusted up and down every inch for optimum cart configuration. Fast assembly without tools: Numerically calibrated grooved posts, tapered high temper­a­ture resistant plastic split sleeves and shelf collars combine to make shelving assem­bly a simple two-step exercise: 1) Snap the split sleeves onto the posts at the location of your choice; 2) Slide the collars of the shelf over the split sleeves. A positive lock be­tween the shelf and the split sleeves is creat­ed without the use of any tools, becoming stronger as additional weight is add­ed to the shelving. Variety of 5" diameter, 1 1/4" wide casters available. 68" overall height. Shipped knocked-down. CC1836Z-S 18" x 36" EAGLEbrite® zinc, stem caster cart. Swivel caster, resilient wheel tread. CC1836Z-SB 18" x 36" EAGLEbrite® zinc, stem caster cart. Swivel/Brake caster, resilient wheel tread. CC1836Z-SBP 18" x 36" EAGLEbrite® zinc, stem caster cart. Swivel/Brake caster, poly wheel tread. CC1836Z-SP 18" x 36" EAGLEbrite® zinc, stem caster cart. Swivel caster, poly wheel tread. CC1836Z-SR 18" x 36" EAGLEbrite® zinc, stem caster cart. Swivel/Rigid caster, resilient wheel tread. CC1836Z-SRP 18" x 36" EAGLEbrite® zinc, stem caster cart. Swivel/Rigid caster, poly wheel tread. CC1848Z-S 18" x 48" EAGLEbrite® zinc, stem caster cart. Swivel caster, resilient wheel tread. CC1848Z-SB 18" x 48" EAGLEbrite® zinc, stem caster cart. Swivel/Brake caster, resilient wheel tread. CC1848Z-SBP 18" x 48" EAGLEbrite® zinc, stem caster cart. Swivel/Brake caster, poly wheel tread. CC1848Z-SP 18" x 48" EAGLEbrite® zinc, stem caster cart. Swivel caster, poly wheel tread. CC1848Z-SR 18" x 48" EAGLEbrite® zinc, stem caster cart. Swivel/Rigid caster, resilient wheel tread. CC1848Z-SRP 18" x 48" EAGLEbrite® zinc, stem caster cart. Swivel/Rigid caster, poly wheel tread. CC1860Z-S 18" x 60" EAGLEbrite® zinc, stem caster cart. Swivel caster, resilient wheel tread. CC1860Z-SB 18" x 60" EAGLEbrite® zinc, stem caster cart. Swivel/Brake caster, resilient wheel tread. CC1860Z-SBP 18" x 60" EAGLEbrite® zinc, stem caster cart. Swivel/Brake caster, poly wheel tread. CC1860Z-SP 18" x 60" EAGLEbrite® zinc, stem caster cart. Swivel caster, poly wheel tread. CC1860Z-SR 18" x 60" EAGLEbrite® zinc, stem caster cart. Swivel/Rigid caster, resilient wheel tread. CC1860Z-SRP 18" x 60" EAGLEbrite® zinc, stem caster cart. Swivel/Rigid caster, poly wheel tread. CC2136Z-S 21" x 36" EAGLEbrite® zinc, stem caster cart. Swivel caster, resilient wheel tread. CC2136Z-SB 21" x 36" EAGLEbrite® zinc, stem caster cart. Swivel/Brake caster, resilient wheel tread. CC2136Z-SBP 21" x 36" EAGLEbrite® zinc, stem caster cart. Swivel/Brake caster, poly wheel tread. CC2136Z-SP 21" x 36" EAGLEbrite® zinc, stem caster cart. Swivel caster, poly wheel tread. CC2136Z-SR 21" x 36" EAGLEbrite® zinc, stem caster cart. Swivel/Rigid caster, resilient wheel tread. CC2136Z-SRP 21" x 36" EAGLEbrite® zinc, stem caster cart. Swivel/Rigid caster, poly wheel tread. CC2148Z-S 21" x 48" EAGLEbrite® zinc, stem caster cart. Swivel caster, resilient wheel tread. CC2148Z-SB 21" x 48" EAGLEbrite® zinc, stem caster cart. Swivel/Brake caster, resilient wheel tread. CC2148Z-SBP 21" x 48" EAGLEbrite® zinc, stem caster cart. Swivel/Brake caster, poly wheel tread. CC2148Z-SP 21" x 48" EAGLEbrite® zinc, stem caster cart. Swivel caster, poly wheel tread. CC2148Z-SR 21" x 48" EAGLEbrite® zinc, stem caster cart. Swivel/Rigid caster, resilient wheel tread. CC2148Z-SRP 21" x 48" EAGLEbrite® zinc, stem caster cart. Swivel/Rigid caster, poly wheel tread. CC2160Z-S 21" x 60" EAGLEbrite® zinc, stem caster cart. Swivel caster, resilient wheel tread. CC2160Z-SB 21" x 60" EAGLEbrite® zinc, stem caster cart. Swivel/Brake caster, resilient wheel tread. 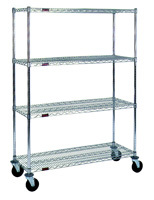 CC2160Z-SBP 21" x 60" EAGLEbrite® zinc, stem caster cart. Swivel/Brake caster, poly wheel tread. CC2160Z-SP 21" x 60" EAGLEbrite® zinc, stem caster cart. Swivel caster, poly wheel tread. CC2160Z-SR 21" x 60" EAGLEbrite® zinc, stem caster cart. Swivel/Rigid caster, resilient wheel tread. CC2160Z-SRP 21" x 60" EAGLEbrite® zinc, stem caster cart. Swivel/Rigid caster, poly wheel tread. CC2436Z-S 24" x 36" EAGLEbrite® zinc, stem caster cart. Swivel caster, resilient wheel tread. CC2436Z-SB 24" x 36" EAGLEbrite® zinc, stem caster cart. Swivel/Brake caster, resilient wheel tread. CC2436Z-SBP 24" x 36" EAGLEbrite® zinc, stem caster cart. Swivel/Brake caster, poly wheel tread. CC2436Z-SP 24" x 36" EAGLEbrite® zinc, stem caster cart. Swivel caster, poly wheel tread. CC2436Z-SR 24" x 36" EAGLEbrite® zinc, stem caster cart. Swivel/Rigid caster, resilient wheel tread. CC2436Z-SRP 24" x 36" EAGLEbrite® zinc, stem caster cart. Swivel/Rigid caster, poly wheel tread. CC2448Z-S 24" x 48" EAGLEbrite® zinc, stem caster cart. Swivel caster, resilient wheel tread. CC2448Z-SB 24" x 48" EAGLEbrite® zinc, stem caster cart. Swivel/Brake caster, resilient wheel tread. CC2448Z-SBP 24" x 48" EAGLEbrite® zinc, stem caster cart. Swivel/Brake caster, poly wheel tread. CC2448Z-SP 24" x 48" EAGLEbrite® zinc, stem caster cart. Swivel caster, poly wheel tread. CC2448Z-SR 24" x 48" EAGLEbrite® zinc, stem caster cart. Swivel/Rigid caster, resilient wheel tread. CC2448Z-SRP 24" x 48" EAGLEbrite® zinc, stem caster cart. Swivel/Rigid caster, poly wheel tread. CC2460Z-S 24" x 60" EAGLEbrite® zinc, stem caster cart. Swivel caster, resilient wheel tread. CC2460Z-SB 24" x 60" EAGLEbrite® zinc, stem caster cart. Swivel/Brake caster, resilient wheel tread. CC2460Z-SBP 24" x 60" EAGLEbrite® zinc, stem caster cart. Swivel/Brake caster, poly wheel tread. CC2460Z-SP 24" x 60" EAGLEbrite® zinc, stem caster cart. Swivel caster, poly wheel tread. CC2460Z-SR 24" x 60" EAGLEbrite® zinc, stem caster cart. Swivel/Rigid caster, resilient wheel tread. CC2460Z-SRP 24" x 60" EAGLEbrite® zinc, stem caster cart. Swivel/Rigid caster, poly wheel tread.